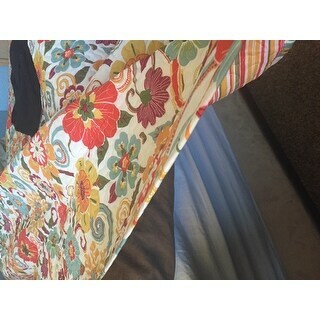 Colors are very vibrant and it is a nice quality for the price. 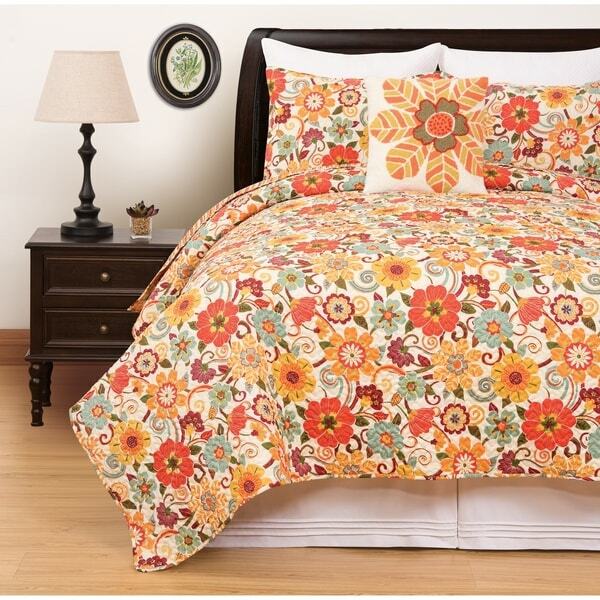 Beautiful blossoms gracefully float on the retro inspired Courtney quilt set. Featuring spicy tones of orange, yellow and merlot on a soft white ground with fun swirls, this quilt brings the flower power. Finished with a fabric edge and vermicelli stitching, this quilt is reversible to a coordinating stripe. Crafted of soft microfiber Courtney is machine washable for easy care. All over print featuring spicy tones of orange, yellow and merlot on a soft white ground with fun swirls and flower power. Colors are exactly what they are in the picture. Very vibrant, beautiful colors. The quilt is lightweight which makes it easy to wash if necessary. 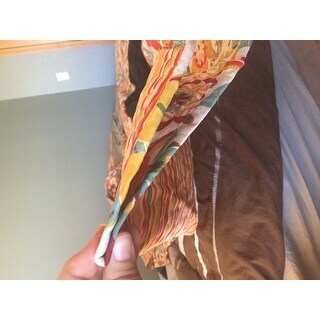 The quality is excellent as the stitching is tight and therefore lays flat on the bed. Would look good with any furniture. I used with a Victorian style furniture set and it looks great. Would definitely recommend. The colors are beautiful, exactly as pictured. 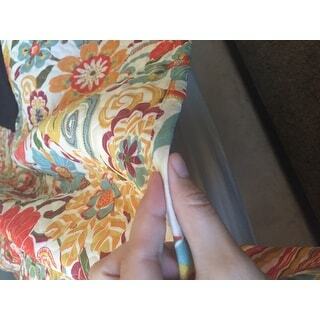 But the quilt itself has the thickness and texture of two stiffly-starched sheets stitched together. It’s less than a quarter inch thick, if that. Absolutely no warmth at all. I’m not sure how many times they folded it to get that fluffy look up near the pillows, but it had to have been a fair few. Either that or a nice, thick blanket underneath. I expected a lightweight quilt, but this is pushing things a bit too far. It was just right for the colors I needed. But overall it is simply a average grade quilt. So the cost is right. Good but not high quality.